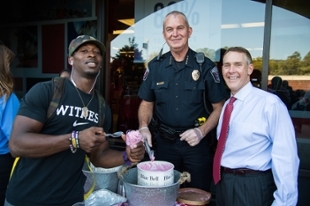 UPD Chief Shawn Giddy (center) and President John Beehler serve ice cream to students a SGA/UPD mixer. Before students head out of town for spring break, the Student Government Association and JSU Police Department will host Campus Safety Week on March 12-15 to educate the campus on personal safety. Representatives from both the SGA and UPD will be on campus throughout the week to provide safety tips and training. Monday, March 12 – Vehicle Safety Table: 11 a.m.-2 p.m. in the TMB lobby. Tuesday, March 13 - Impaired Vision Driving Course: 11 a.m.-2p.m. at the Stephenson Hall Parking Lot. Wednesday, March 14 – UPD Active Shooter Training: Two 30-minute sessions, one at 10 a.m. and the other at 1 p.m. will be held at 1103C Houston Cole Library. Thursday, March 15 - UPD/SGA 2nd Annual Student Appreciation Day Event: This event that culminates Campus Safety Week is set for 10 a.m.-2 p.m. in the Leone Cole Auditorium. It will include food, music, a blue decal drawing. Plus, multiple organizations will host tables and promote different safety topics. Student Appreciation Day is the result of a partnership formed in the 2016-2017 year between the UPD and SGA to improve the relationship between students and campus police.